The Arwing as a ship for FTL:AE. Uses a lot of hidden game mechanics to make a unique experience; A deadly powerful ship which can easily be put out of action in a few hits. Start the game by choosing which member of the Starfox team you'll play as, then use the pre-planned upgrades as you to prepare to take down the Flagship. For more information visit the official forum page via the 'Homepage' link. The second release of the mod. Includes Adventures pack, which is recommended to be run alongside the ship. 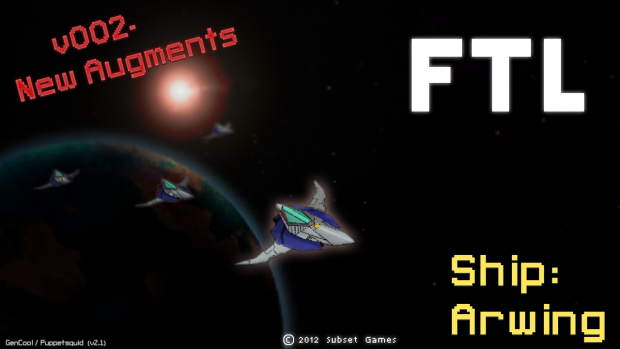 Updates a few bugs and layout issues with the Arwing ship, start events, and a bunch of weapons/drones. The first release of the mod. Due to the nature of what I'm trying to do with this mod, there's one or two small bugs that cannot be fixed, but they do not affect gameplay.